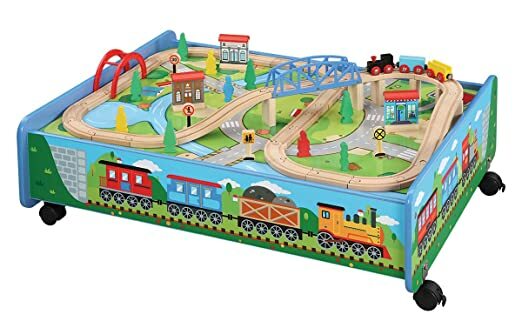 ToysRUs.com has Fisher-Price GeoTrax Train Table and RC Set on sale for only $49.99 (Reg.$179.99). Shipping is free. 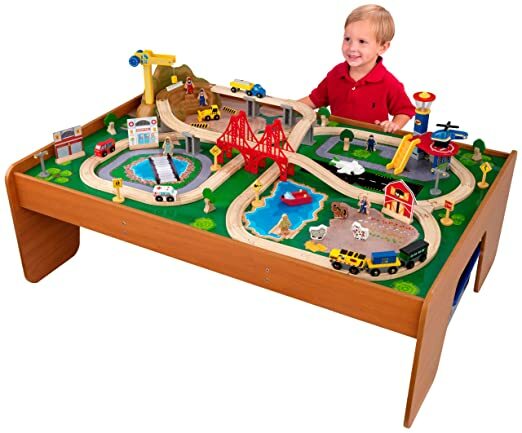 Design and build your own unique train track with the Fisher-Price GeoTrax Train Table and RC Set. It includes three tables you can put together any way you like, depending on how you want to set up your track. You can use the pull-out storage drawer beneath the tables to keep all your figures, track pieces and accessories close at hand. There's even a remote control, Snap-Lock track and a rail station for you to begin building, or add to your existing, GeoTrax world. Use the included Bruno figure to man the rail station. Remember, it all works together. Wooden 50-Piece Train Set with Small Table Only At Walmart 这套火车玩具包括了50-piece train set and accessories， table 和 storage bin。 原价要80刀， 现在打折后只要$44.88 with free in store pick up. 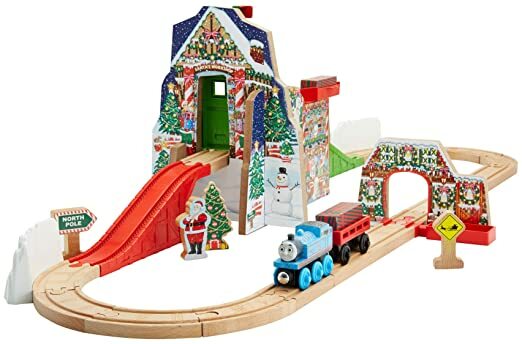 Amazon has Fisher-Price Thomas the Train TrackMaster Holiday Cargo Delivery Set for $39.99 (reg. $79.99). Shipping is free. 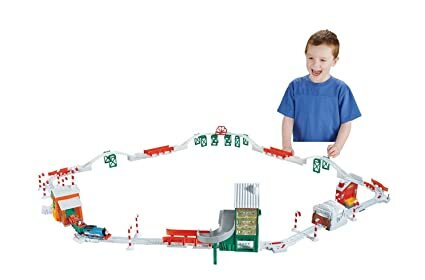 This set includes complete holiday-themed track layout with motorized talking Thomas, Sir Topham Hatt's house, candy cane factory, tunnel, school, and three stop-tracks. Accessories include Sir Topham Hatt dressed as Santa, 3 cargo cars, barrel of candy canes, holiday gift cargo, and decorative track-side candy canes. Amazon 现在 you can buy this highly rated Fisher-Price Thomas the Train Wooden Railway Santa’s Workshop Express for just $46.76 (regularly $108) – BEST PRICE! This set includes Thomas with special snow decor, a Christmas tree, Sir Topham Hatt as Santa Clause, Santa crossing sign, 2 presents, a cargo car, & North Pole sign! ToysRus.com Imaginarium All-in-One Wooden Train Table 100-Piece Set 降价 $47.99 (regularly $129.99)， Shipping is free or select free store pickup. 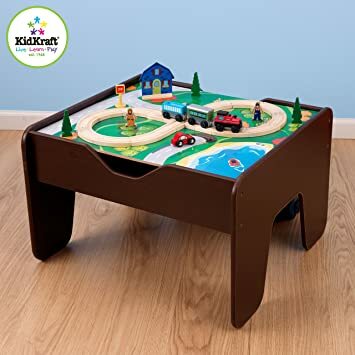 Amazon.com now this Kidkraft 2-in-1 Activity Table for only $50.89 shipped. The table includes a bag of 200 LEGO compatible blocks and a 30-piece train set. The double-sided play board is smooth on one side and made of LEGO compatible material on the other side, and is lightweight enough that it can be easily flipped back and forth. Walmart.com now you can get this KidKraft Bucket Top Mountain Train Set for only $23.29 (regularly $31.57) when you choose to do in store pick up. This train set includes over 60 pieces including trees, vehicles and signs and a durable storage bucket to keep everything contained. Amazon now is offering this KIDKRAFT Disney Pixar Cars 3 Thomasville 70-Piece Wooden Track Set with Accessories and Table for just $90.76 shipped (regularly $149.99)! This set comes with 70 pieces, including 6 Disney Pixar cars characters! The garage features lift-and-lower doors and the table is built of sturdy wood construction. Today, November 17th only, Amazon is offering up to 40% off select Kidkraft items. Plus, all of the available items ship for free. 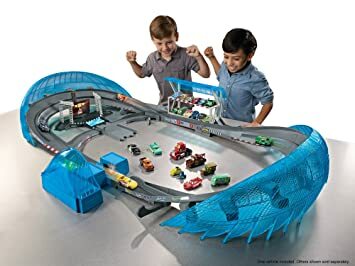 Amazon Disney/Pixar Cars 3 Ultimate Florida Speedway Track Set, Only $49.97 shipped (regularly $99.99) – LOWEST PRICE. 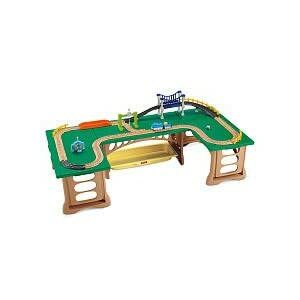 Walmart.com now you can get this Disney Pixar Cars 3 Thunder Hollow Criss-Cross Track Set for just $19.97 (regularly $49.97)! This Disney Pixar Cars 3 track set features crashing, competition derby action and includes a fun mud-covered Lightning McQueen vehicle. 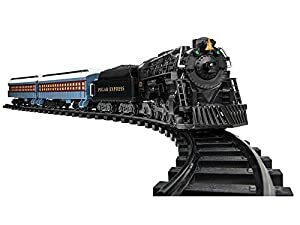 Hurry over to Amazon, now they have the Lionel Polar Express Ready to Play Train Set marked down to just $52.49 shipped (regularly $99.99)! Walmart now you can get this KidKraft Lego Compatible 2-in-1 Activity Table for just $39.97 shipped (regularly $99.96) – lowest price ever! This activity table features a two-sided play surface, one is a flat surface with a road design and the other is compatible with Lego blocks. It includes 200 building bricks and a 30-piece wooden train starter kit. When your kiddos are done playing, you can lift the top surface to store their toys underneath. 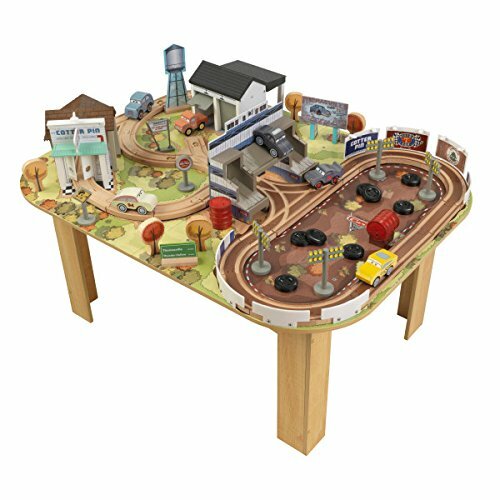 Amazon (Prime Members only) to get this KidKraft Disney Pixar Cars 3 Florida Racetrack & Table for only $54.97 – regularly $149.99! 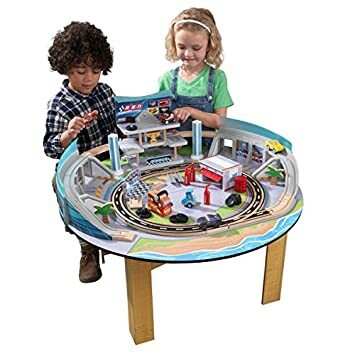 This racetrack set and table comes with a 3-story tower, garage doors that open and close, over 12 feet of track, and 50+ pieces including fun Cars characters. And, it’s all made by KidKraft so you know its high quality! ToysRus.com this Imaginarium 80+ Piece Mega Train World for only $24.99 (regularly $39.99). Even better, through December 24th, ToysRUs.com is offering a $5 Promotional eGift Card with select in-store pickup orders AND the train set qualifies for the gift card! The eGift card will be emailed 5-7 days after you pickup your order and expires on January 31st. 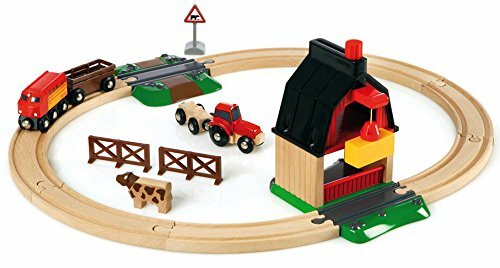 On Amazon.com you can now buy this Maxim Enterprise 62-Piece Wooden Train Set with Table for only $46.50 shipped (regularly $97.01). This all-in-one train set with table has wheels that lock and unlock for easy moving. 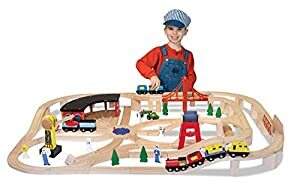 It is compatible with all major wooden railway systems including BRIO, Thomas & Friends, Imaginarium and more! Plus, there are 62 fun pieces your kiddo can use to create their own train adventures for hours of playtime. 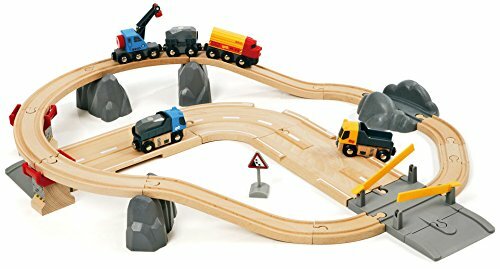 On Amazon.com now you can save up to 55% off select Brio Wooden Toys. All BRIO railway sets are designed to work together and also fit most other wooden train sets. 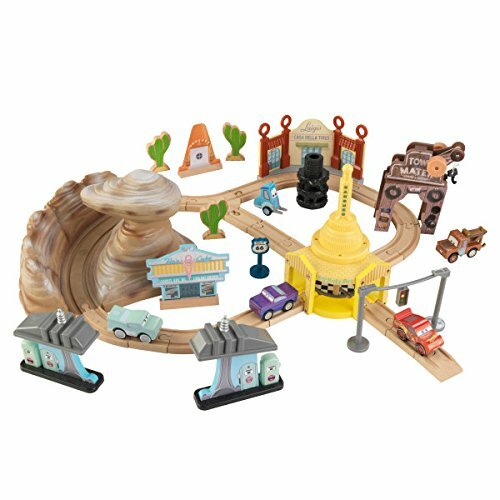 On Amazon.com you can now get this KidKraft Disney Pixar Cars 3 Radiator Springs 50-Piece Wooden Track Set with Accessories for just $32.99 (regularly as much as $99.99)! And shipping is free. This KidKraft Track Set includes a track and scenery from the Disney Pixar Cars 3 movie like the Radiator Springs rock formation, Willy’s Butte and Ramone’s garage. It also comes with five different characters and the pieces are built from solid wood to provide years of imaginative play.